The Galaxy Gear is not the only device Samsung is revealing at this year’s IFA conference in Berlin. The company has also unboxed its Samsung Galaxy Note 3 phablet, now thinner and larger than its predecessor. The new Galaxy Note 3 sports slimmer bezels and sharper angles on its rounded edges, which is slightly different from the usual designs found in Galaxy line of devices. It has a larger 5.7-inch Super AMOLED screen with 1080p resolution, but Samsung has managed to make its latest phablet thinner and lighter, as well as having a longer battery life and an improved S Pen stylus. 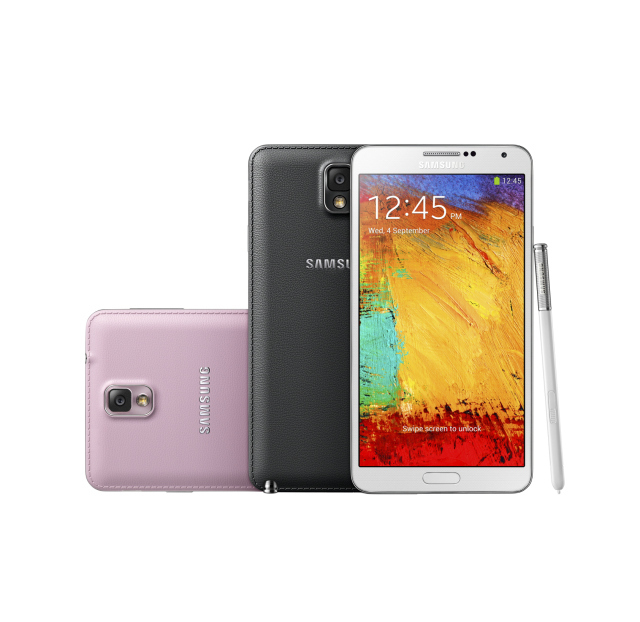 The Samsung Galaxy Note 3 features 4K video recording capabilities, a new CRI LED flash for improved low-light photography, 2.3GHz Snapdragon 800 processor (or 1.9GHz Samsung Exynos Octacore in some markets), Android 4.3, a 13-megapixel rear-facing camera (along with a 2-megapixel front camera), 3GB RAM, up to 64GB of internal storage, and a microSDXC card slot. It also has a metallic rim around the edge, a 3,200mAh battery, Bluetooth and WiFi connectivity, and a “seamless LTE” with multi-band support. 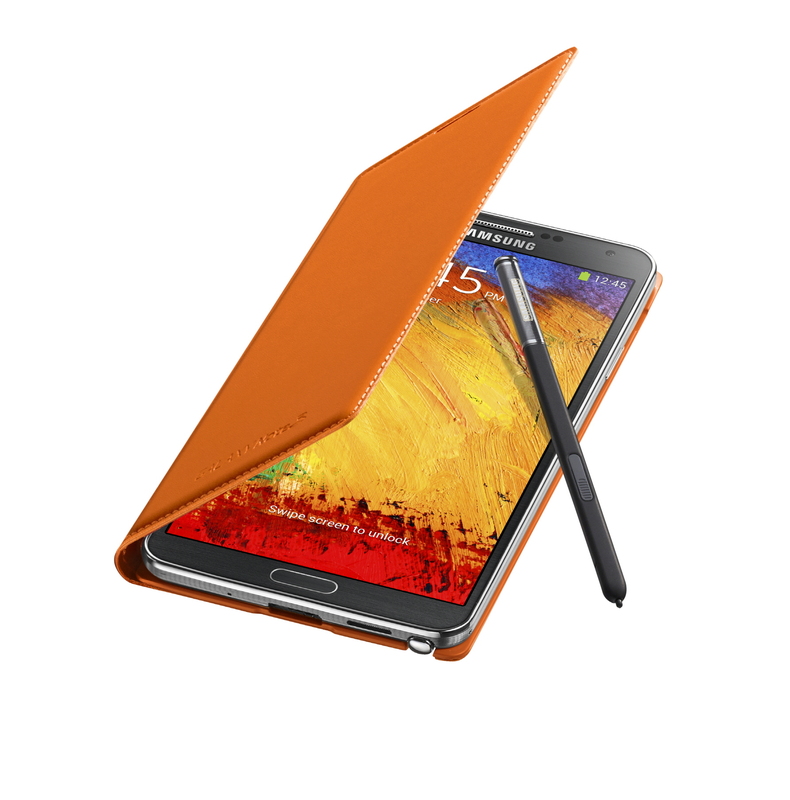 It also ships with stiched leather rear cover, which comes in three colors (white, black, and pink). There is even a flip wallet accessory that can be purchased separatedly, which is available in 10 different colors and a larger S View window for making calls, checking messages, and accessing the phablet without having to activate the whole display. The new S Pen provides access to Note 3’s full potential, as it works on several new interface controls. Activate “Air Command” and a dot appears on the screen, which provides quick navigation to memo, scrapbooking, screenwriting, and a finder search capability. Draw a circle on the screen with the S Pen and it captures the content, saving it onto your scrapbook. Its multitasking feature lets you perform two tasks at once through a picture-in-picture interface. The phablet comes pre-installed with Samsung’s Knox mobile security service, which helps increase enterprise and consumer security through partitioned software. The Samsung Galaxy Note 3 will be available beginning September 25 in 149 countries.